So...here we are...10 days away from the Opening Ceremonies of the 2012 Summer Olympics in London and all the planning is done and it is time to pack up and head overseas. Since this is my third time shooting at the Olympics, I have a better idea of what I need to bring and what I can borrow when I get to London. But, even with this prior knowledge, the packing process for this type of event is still stressful. The toughest part of the challenge is determining which camera gear to bring and what to leave back home. 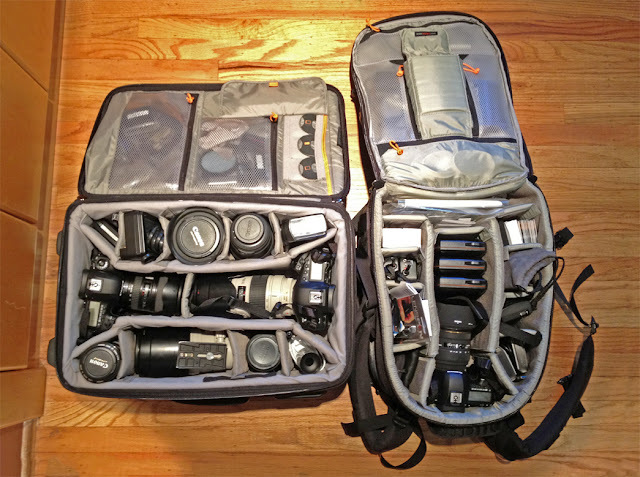 Usually when I travel with camera gear, it is one camera body, 3 or 4 lenses, one flash and a tripod. But this time, it is 2 MacBook Pro laptops, 3 camera bodies, 9 lenses, 4 pocket wizards, 4 WD 2TB hard drives, tripod, monopod, chargers, adaptors, tons of 1000x memory cards, camera batteries, rechargeable AA batteries...and so much more! All packed into my two trustworthy LowePro bags. These are my two carry-on bags. If the airline loses my clothes, I don't care, but these stay with me! This time around, the biggest stress that I endured was whether or not I would get a Canon 1Dx to shoot with. As you might know, if you are into photography, this camera was supposed to be available in April and just started shipping a couple of weeks ago. And, since they are in very short supply, they are being doled out by Canon, mainly to Olympic photographers. Well, my good friends at Canon came through last week, and not only did they get me one to use, they surprised me with a second one on Friday. Awesome! As you might be able to see from the photo (taken with my iPhone since all my camera gear is packed up), I am taking mostly short lenses. Except for my 100-400mm lens, everything is 200mm or less. That does not mean that I will be limited to shooting with these lenses since we are spoiled at the Games. Canon and Nikon both bring a massive amount of gear for us to borrow while in the country. There is nothing better than showing up to the press center in the morning and having your pick of whatever you want. It is seriously like a kid in a candy shop! "I think I will take a 600mm 4.0, and a 400 DO please". Love that! Before the Olympics, I will be taking a couple of days of R and R in Paris and London, so stay tuned for some Parisian images and then the big event! I love the idea of Canon and Nikon having equipment there for you to use! Please take shots of how that works! Do they just have a central location where you can borrow gear? I'd love to have more insight into how that works! Good luck and happy shooting! How do you get both of those bags on the plane as carry-ons? Dana, It was actually quite easy to get both bags on the plane. The rolling bag is basically the same size as any carry on luggage and the backpack is the other allowed piece. The other big suitcase with all my clothes, tripod, monopod, magic arm...was check under the plane. Very nice bag Jeff! You surely have lots of photographic gears ready for the Olympics. Hoping to see some of your great photos! Wow!! nice bag to pack camera gear for Olympics. You are a Photographer So I want to see your capture images. I really like your post about photography equipment, it is helpful for me to choose a nice one. Why do you use two laptops ? Did you take a battery charger and speedlights ?